Trial, 2015 Amgen Tour of California. Think about it – 8 days of racing, over 700 hundred miles ridden and the race is won by the width of a tire! That’s how it came down at the 2015 Amgen Tour of California. 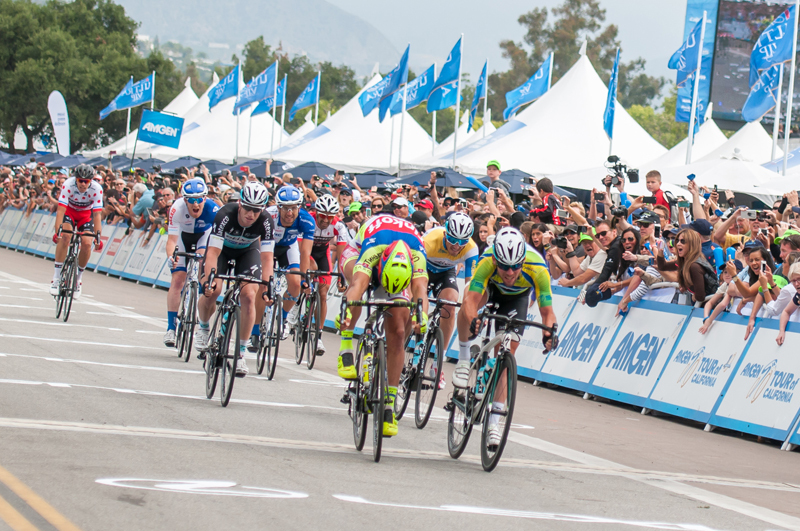 The Amgen Tour of California (AToC) is the biggest stage race in the US. More World Tour teams and riders race the AToC than any other race in the US. This year, for the 10th anniversary of the race, it featured a three stage Women’s race plus an invitational Women’s time trial. Unfortunately, my schedule conflicted and I wasn’t able to attend the Women’s race. It’s a beautiful course covering the length of California from majestic Redwood trees and pine forests to the beautiful beaches of Southern California. The race is a showcase for the beauty of the “golden” state. Media coverage was extensive, numerous photographers stacked the finish lines and the daily post race press conferences were packed. NBC Sports broadcast a daily show featuring each stage as well as streaming online coverage. So what’s it like to race an event of this caliber? 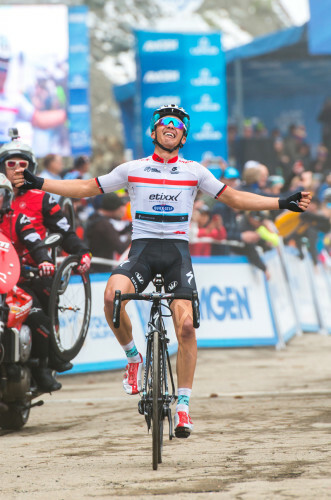 Eighteen teams with up to eight riders each were invited to the AToC this year. This included eight World Tour teams, four Pro Continental teams and six Continental teams. That’s quite a mix of varying skill levels, experience and team budgets all competing for the same prizes. The Continental teams found it difficult to make a showing against the World Tour teams. As one team director told me it was very hard to make a successful breakaway or win a stage because the World Tour teams were so dominant. I guess that’s why they’re World Tour teams, he said. But that didn’t stop them from trying. Riders from Hincapie, Axeon, Optum and others were constantly forming breaks and attacks trying to get out front of the main action. “Since its inception, Medalist Sports is proud to partner with AEG and the Amgen Tour of California. Similar to the experience in Utah, the Amgen Tour of California is an annual showcase of world-class competition combined with picturesque beauty. All of these events keep getting better and better, making the U.S. a top destination for professional cycling, both men and women”. I think it’s safe to say that races such as the Amgen Tour of California along with the Tour of Utah and the USA Pro Challenge are shaping up to make the United States an important venue for world class stage racing. Back to the race. Sunday May 10th, Stage 1 was fast and flat, 127 miles long around Sacramento. It all came down to a bunch sprint with Mark Cavendish’s amazing speed capturing the stage and donning the leader’s yellow jersey. Stage 2 ran from Nevada City (a town where Greg LeMond made his racing debut I believe) to Lodi. 120 miles in length, the stage came down to another sprint won by Cavendish (Etixx Quick-Step). Stage 3 featured 105 miles of steep climbs and twisty descents around San Jose. Young rider Tom Skujins of Hincapie Racing won the stage and captured the yellow jersey. Stage 4 showcased the California coast with riders starting at the Pismo Beach Pier, riding 107 miles to finish at Avila Beach. Peter Sagan (Tinkoff Saxo) dominated to win this stage on a slightly uphill sprint finish and Skujins retained the leader’s jersey. Stage 5 started in Santa Barbara saying goodbye to the beaches and headed inland to finish in Santa Clarita after 98 miles of steep climbs and “white knuckle” descents. In spite of the climbing, the group came together for Mark Cavendish to take another win and Skujins stayed in yellow. Stage 6 was scheduled to be a 15 mile time trial at altitude around Big Bear Lake. However, Mother Nature intervened dumping heavy snow and the TT was relocated to Six Flags Resort outside of Santa Clarita at the last moment. The race organizers pulled off a monumental feat relocating hundreds of riders, staff and course setup overnight. The new course was shortened to 6.6 miles which I’m sure the TT specialists didn’t appreciate, but hey, that’s bike racing. Peter Sagan again proved the critics wrong by winning the TT and taking over the yellow jersey. Evelyn Stevens (Boels Domans) won the women’s TT held on the same course prior to the men’s event. Stage 7 was the 80 mile long queen stage featuring the fearsome climb up Mt. Baldy. The race left Ontario climbing up towards the Mt. Baldy Road, then turned left for a large loop on the Glendorra Mountain Road with major climbs, KOMs and descents before returning to make the final climb to Mt. Baldy. This last section contains numerous steep switchbacks that were shrouded in fog and rain from the morning’s storm. This was the stage that everyone believed would determine the overall winner for the race. As we waited at the finish line, the fog began to lift a bit. Radio and TV signals kept dropping out so we were unsure who was leading the race. Word came that Julian Alaphillippe (Etixx Quick-Step), the rising young French rider, was battling it out on the climb with Columbian Sergio Henao (Sky). Then suddenly, a rider burst through the fog at the finish line. It was Alaphillippe who had managed to drop Henao and his teammate Ian Boswell for the big win taking over the yellow jersey. A few more riders straggled in then, surprise, Sagan rode out of the fog to collapse at the finish line. Sagan had been taking heat all week in the press conferences about his lack of wins this spring. His team owner, Oleg Tinkoff has grumbled publicly about it. I guess Sagan decided he had something to prove. For a big, stocky guy who you wouldn’t expect to climb well, he turned himself completely inside out that day leaving everything he had on the mountain. Sagan finished 46 seconds out putting him in 2nd place overall, 2 seconds behind Alaphillipe, the new yellow jersey wearer. Stage 8 began on a beautiful morning in downtown LA. The final stage today would feature circuits around the Staples Center then head out to Pasadena for 9 finishing circuits around the famed Rose Bowl Stadium for a total of 60 miles. The first Rose Bowl circuit intermediate sprint would offer time bonuses of 3, 2 & 1 seconds for the first three riders. Sagan was 2 seconds behind. Cavendish is Alaphillipe’s teammate. Could Cav block Sagan’s attempt at the time bonuses and assure Alaphillippe’s victory? The intermediate sprint began, Cav was doing about 45 mph to win the sprint. Sagan took 2nd garnering 2 seconds, but Alaphillipe was third to claim 1 second and keep his lead on the road. Eight more laps to go and Sagan is now only 1 second out of overall victory. The fans were going crazy! Who could have predicted that a week long race victory would come down to 1 second in the final moments of racing? The riders kept lapping the stadium, attempting breaks, but nothing would stick. Etixx Quick-Step was determined to bring Cavendish another stage win and Alaphillipe the overall. 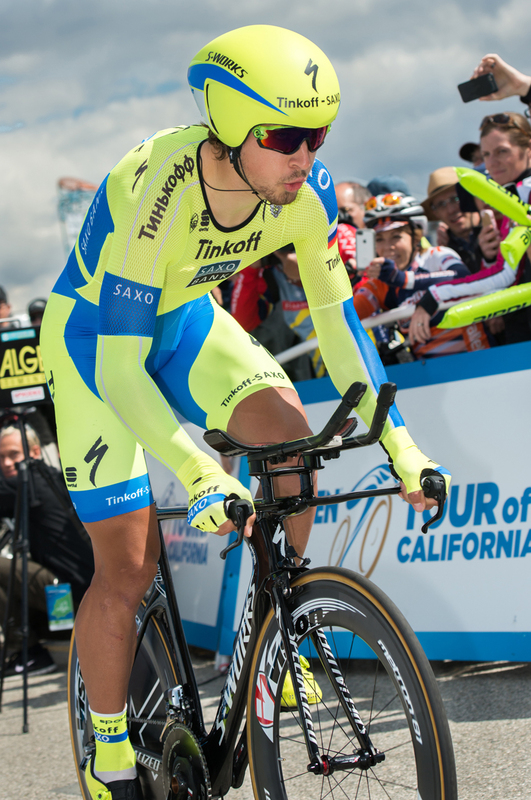 Tinkoff Saxo was drilling it, committed to bringing Sagan to the line netting a time bonus to take the yellow jersey. Everyone else was fighting for a win to spoil those plans or just hanging on due to the furious pace of the peloton. The bonuses on offer were 10, 6 & 4 seconds for the top three. Here they come, the final lap and the sprint begins. Cavendish jumps out in front, assured to take the stage. Wippert (Drapac) clearly takes second. What happens next is astounding. It appears that Farrah (MTN Qhubeka) and Sagan (Tinkoff Saxo) have tied for 3rd. Who won? Who gets the time bonus? Only the photo finish will tell. The crowd awaits nervously. Alaphillipe thinks he may have got it, Sagan isn’t sure. Then the announcement comes. Sagan beat Farrah by the width of a tire to secure the time bonus of 4 seconds, thus moving ahead of Alaphillippe to win the overall race by a total of 3 seconds! Tanner Putt (Utah, UHC) finished in 107th place with a time of 29:06. Dave Richards is a Utah-based photographer. You can find his work at daverphoto.com and in the pages of Cycling Utah.